As I mentioned in a recent post, Southampton has seriously upped its foodie game in the past few years – with multi-million pound investments to various parts of the city, the new restaurants mean there’s such a huge choice if you’re looking for somewhere to eat. Though I’m usually found eating in the West Quay Watermark, we ventured up to Guildhall Square last week to eat at The Stable. This is known as the Cultural Quarter, and there are some lovely restaurants as well as my favourite coffee house (Mettricks) up here. I’ve been to The Stable before, but we were invited to try their new menu recently and we very gladly booked a reservation. The Stable is a very refreshing restaurant experience – there are a lot of places serving food in a deliberately American style, whereas The Stable focuses on staying local. Starting nearby in Dorset, the simple concept was born – fine food and cider. It’s a brand that has grown across the South and it stands out from the rest – it really does have a very friendly atmosphere and the food is all locally sourced. So, depending on the restaurant you visit, the ingredients will be different – and it’s a refreshing, honest approach to food that I love. The new menu includes some additions that started out as specials, and were so popular, earned a permanent residence. They’ve also added new pizzas, salads, charcuterie and cheese sharing boards as well as the arrival of The Stable’s first house ice cream – made especially for them by a farm based in Devon. The Stable in Southampton has an industrial mixed with countryside living feel – high ceilings and elements of metal mixed with wooden walls and plants. We were seated on the mezzanine level and it was perfect to be able to look down at the people below, as well as being a little more separate from those who were just coming for a drink. The amount of choice of Cider on tap is certainly a cider-lovers dream, and definitely a selling point of the place. 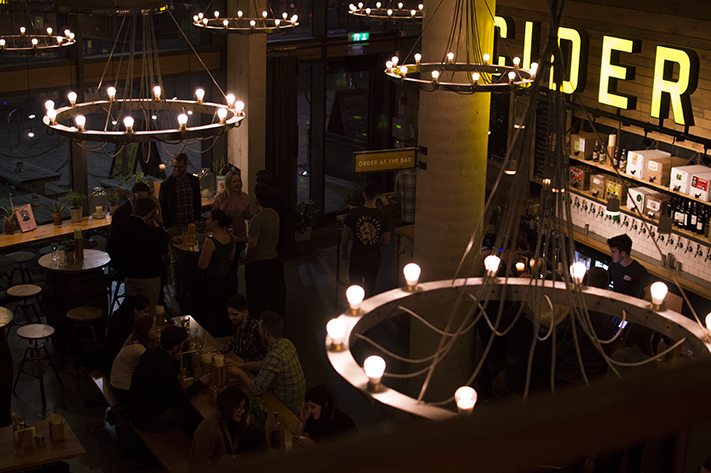 The Stable seems like a place you can come for drinks and a chilled out atmosphere, as well as place you can come with family if you fancy some pizza. After perusing the menus (the lettering, styling and touches of gold foil were much appreciated by us designers), we ordered at the bar. The queues cleared very quickly with the staff behind being very efficient, and we were back at our table in no time at all. We started with the garlic bread, and goodness, this was far too easy to eat! It was really thin and crispy, slathered with delicious garlic butter. Graham also had an Ashridge Devon Gold cider, which he said was lovely and very smooth. I’ve eaten a pizza there before, so this time I opted for the The Lamb Bamb Boogie pie. It was delicious and the pastry very light and crumbly, served with a mountain of salad and some chunky potato wedges. 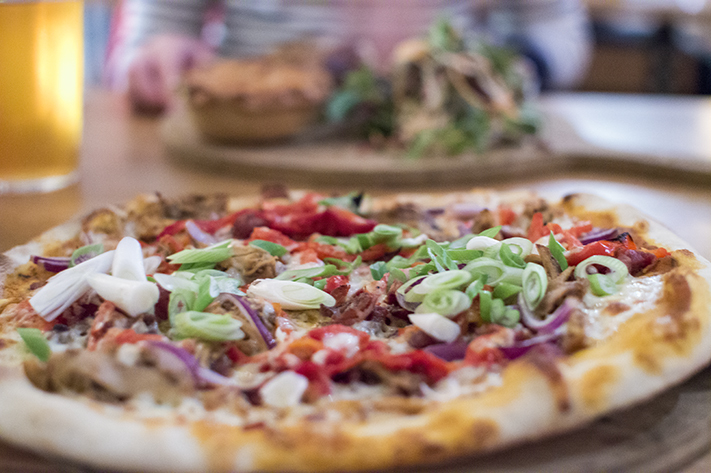 Graham had ‘The Big Jerk’ pizza, which is a new addition, and loved it – jerk-chicken, bacon, red peppers and mozzarella on a thin base. For pudding, we tried the new ice cream. You can choose three scoops from their five different flavours, as well as the choice of crushed nuts or raspberry coulis toppings. I’m a huge fan of ice cream and it’s the perfect pud if you fancy something sweet to finish on that isn’t heavy. For a Friday evening, it wasn’t packed out but pleasantly ‘buzzing’ – basically, the perfect size for everyone to do their own thing. Whether you’re after a night out necking some cider (they offer cider tasting boards which are great if you fancy trying a few) or just a romantic evening eating some good food, The Stable is a great bet. A big thanks to The Stable for inviting us to try their new menu.